Teaching Civics in today’s hyperpartisan atmosphere is a dangerous occupation. The issues that make up the dialogue of American politics seem to have separated the American electorate to a higher degree today than in years past. Americans were always able to agree on their common heritage as the greatest democracy in the world. As a nation, we often supported a saying attributed to Voltaire that echoes our First Amendment’s freedom of speech: “I may disagree with what you say, but I’ll defend to the death your right to say it.” We all hold our particular political views dear, almost as sacrosanct as our religious beliefs. But just as Jefferson called for a “wall of separation between church and state,” teachers in public schools must work hard to conceal their political views, lest they unduly influence their young charges to side with one part of the political spectrum over the other. In order to provide an unbiased and egalitarian view of what by nature is a subjective assessment of the government’s role in society, public school teachers in all subject areas and at all levels do not have the academic freedom to express a political viewpoint. They must teach from behind a mask, playing the role of an actor half of the time, especially when they must outline the views of the party or faction with which they disagree. Theoretically, students will be able to arrive at their own conclusions independently of the influence of the authority figure at the head of the class. All political viewpoints are given equal credence. Personal views must be repressed. In my own classroom, the political spectrum has become a tightrope to teach. With the advent of social media and the heightened political atmosphere on the 2016 election, it has become more difficult to appear neutral. Teachers have a responsibility to treat all of their students equally without regard to race, gender, or socio-economic status. As public school teachers, we must make all members of the public feel welcome, no matter where a young person stands on the political spectrum. But just teaching about the political spectrum is a minefield. If it is presented in a way that any stakeholder may disagree, the teacher and the curriculum itself may come under fire. Parents have come especially vigilant that their child does not suffer at the hands of a teacher whose views may differ from their own. Teachers have their own views on the issues, which they often choose to discuss on their Facebook, Twitter, or other social media accounts. But they do so at their own peril. Parents who have access to those accounts then perceive vocal teachers as biased, even if a particular political viewpoint has not been expressed at the front of the classroom. Teachers who are politically active do so because they want to share those views among the electorate so that can help will elections and change policies they believe need amending. Sadly, such activism opens the teacher up to criticism and administrative action even if they keep their activism out of the classroom. Teachers on both sides of the political divide are susceptible to this kind of restriction. In doing research for this article, I was informed by some on the left that public school teachers who hold conservative views should not be given a voice to express their views because those views are inherently anti-egalitarian. When discussing this topic with teachers who might be seen as conservative, there was a concern that teachers with conservative views would be held up to unfair scrutiny. Moreover, it seemed the perception that teachers were predominantly liberal because of the nature of their profession made those who held conservative views more reluctant to conduct a dialogue about those views. It seemed unfair to say that conservative teachers may hold views that are inconsistent with their position as public school teachers. It was made clear to me that public education has strong support from the American conservative movement. Less government regulation, freedom from unfair taxation, support for the traditional family as an institution, and patriotic support for the military, while all seen as conservative ideals, were expressed as consistent with public education. The stereotype of teachers as automatically falling into the liberal camp just because they are public servants is a myth and not reflected in reality. Even teachers currently protesting for higher pay and greater public school funding in “Red States” such as West Virginia, Arizona, and Oklahoma should not be pegged as “liberal” just because they are demanding greater accountability from their state and local governments. They just want to make a living wage so they can concentrate on doing their job of educating America’s youth. 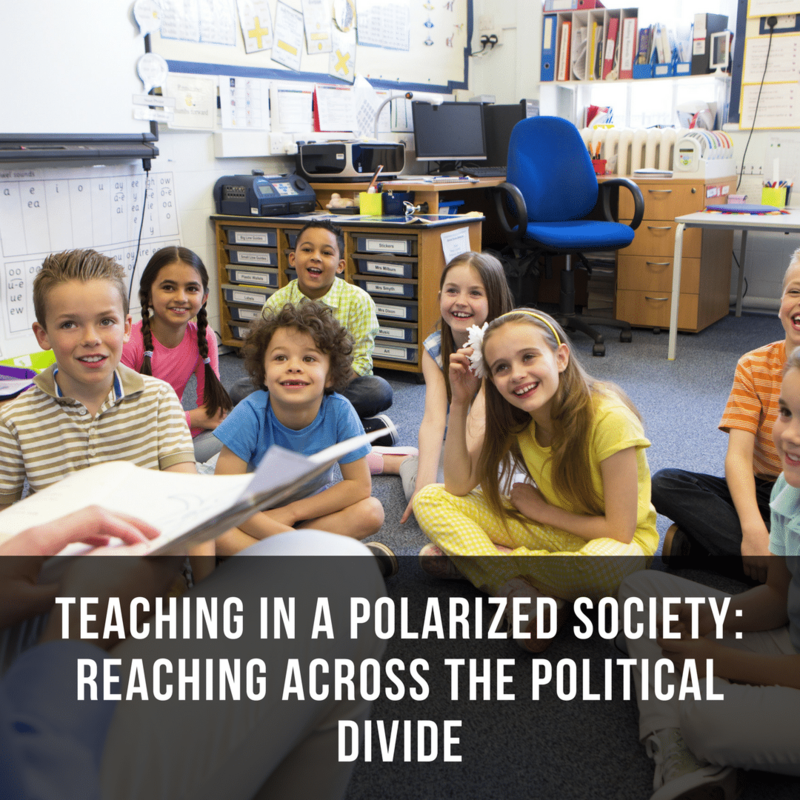 The Election of 2016 has accelerated the polarization of American politics, and this heightened division between Americans is felt in America’s public schools. Just as some families have been divided for their support of their respective candidates, friendships and collegial faculty relationships have been strained by teachers’ support of one candidate over the other. Teachers who identify as Democrats could not understand how their colleagues could throw their support behind a candidate who appeared to be divisive and derisive against women, minorities, immigrants, and the disabled. Those who identified as Republican could never support a candidate who appeared to have a record of dishonesty and deception as the Democratic nominee. There are many ways Americans can be united rather than divided. Volunteering in soup kitchens and in schools means the government can use those resources elsewhere while those who are struggling to make ends meet can have their basic needs met. The Bible not only commands us to care for “these least of these” among us but also to obey those whom God has put in charge, and in America, God allows the people to make those decisions through their participation at the ballot box. Every two years, voters have the chance to change the legislative branch of government in a way that expresses the will of the majority. Every four years, we can choose who will stand for our nation and direct our government in form of the presidency. Most Americans believe it is patriotic to support the person elected by the American people, even if we disagree with his policies. Respect for the presidency, even the man in the office, is a high form of patriotism, and if we disagree with his policies, we can respectfully campaign for anyone who wishes to replace him at the next election. This process is one of the most important aspects of modern American democracy. (George Cassutto, “The State of Politics Today, http://www.cyberlearning-world.com/journal/state_of_politics_today.html, Available, 2015). It is quintessentially American to have strongly held political views. Many have bled and died to defend those views both within our nation and around the world. Pride in America and in our democratic institutions is a unifying force, even if we disagree on the way the policies of our government are carried out. Americans have also learned to embrace equality, diversity, and acceptance of our differences, though sometimes our nation must be dragged kicking and screaming to arrive at a higher level of inclusion. Teachers, in their role as public school educators, are leaders in the shaping of a more inclusive society.